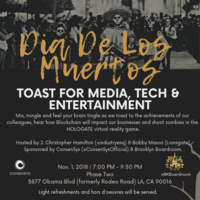 Mix mingle and feel your brain tingle as we toast to the achievements of our colleagues, hear how blockchain will impact our businesses and shoot zombies in the Hologate virtual reality game. Toast to Media, Tech & Entertainment are so good for the students. I just want to give the information about this https://www.thebestessayservice.com/dissertationwriting.html blog, to my students. This is a set rule for the readers to share this blog. The break in routine and from the grind is worth it for the feel-good bennies! That was not only the entertainment that was also really good enjoyment for us in the time of the really need this. For the pressure of the whole year on the https://askpetersen.com/essayhave-com-review/ website I have enjoyed many of the related and really charming festival. Must be like to getting the nice post here visit http://remotedesktopwindows10.com and save the all process for know How to use remote desktop to connect to a windows 10 pc.